Greetings again from the darkness. It’s mind-boggling how many fascinating stories – both large and small – continue to come from World War II, even 75 years later. Writer/director Robert Schwentke (RED, FLIGHTPLAN) abruptly opens his latest with a single soldier desperately running from a posse of Nazi soldiers who appear to be hunting him down. The soldier manages to escape, kicking off an incredible journey that we are informed occurred during the final two weeks of the war (April 1945). Max Hubacher stars as Willi Herold, the soldier we are to assume has deserted his military outfit and is now dirty, hungry and cold as he evades German patrols. Things change drastically for Herold when he stumbles on an abandoned suitcase neatly packed with a German Captain’s coat and full uniform. We are left to wonder what happened to the officer, but do get to watch Willi’s crazy next few days as he impersonates a German officer and assumes command of his situation. 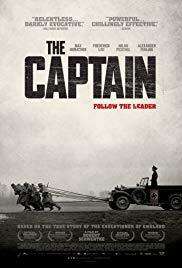 Circumstances result in “Captain” Herold gaining followers, each of whom are as lost or unwilling to continue fighting as himself. The ragtag group ends up at prison camp Aschendorfermoor … a camp containing German deserters and looters. Herold has convinced those in charge that he has direct orders from Hitler to take command of the camp, and a horrific massacre of prisoners takes place over the next few days. 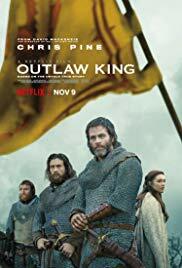 While this is a stunning story ripped from historical documents, the film works even better as a psychological character study. Herold first employs his newfound power as a survival strategy, but he is soon corrupted by the power of his assumed position. We witness as some blindly follow orders, and we watch (dumbfounded) as Herold’s thirst for power overtakes whatever integrity he might have had prior to the desperation injected by war. Greetings again from the darkness. During the movie, Afghanistan is referred to as “the graveyard of many empires”. Traditionally, January is the graveyard of most new movie releases, so it’s a pleasant surprise when we see an entertaining, well-made and historically interesting film, and it’s still mid-January! Doug Stanton’s book “Horse Soldiers” is the source material for director Nicolai Fuglsig’s first feature film, and it’s anything but a disappointment. The film opens on September 11, 2001 and subjects us, yet again, to those horrific images seared into the minds of anyone alive on that day. What most of us didn’t know, was that about a month later, a team of U.S. Army Special Forces (the Green Berets) were being dropped into the rough and mostly unfriendly terrain of Afghanistan. This ridiculously courageous team of 12 men had one mission: secure Mazar-i-Sharif to prevent a takeover by the Taliban. An early scene tells us this won’t be the usual blind patriotism we often see on screen. One of the soldiers, Hal Spencer (Michael Shannon), is told (with a bit of anger) by his wife, “I’ll love you when you get back.” This contrasts to the usual loyal and stiff-upper-lip military wife we see in most war movies. Another wife scrubs the oven rather than snuggle with her man, while yet another coerces a taboo pledge to come home to her. Chris Hemsworth (THOR) plays Captain Mitch Nelson, the intelligent but not-yet-battle-tested leader of a special ops team. The plan is for Nelson and his team to connect with General Dostum, an Afghan War Lord in charge of the Northern Alliance, and fight together to gain control of Mazar. After arriving at a local outpost nicknamed “The Alamo” (34 miles from town), the team gets their first surprise … they must split up and cover the ground on horseback. Filmed in New Mexico, the journey is miserable and filled with danger – an ambush could occur at any moment, or perhaps they are being set-up by those they have been ordered to trust. Horseback riding, caves, the weather, and the elements of the terrain are all challenges, but none of it compares to facing the Taliban forces which number in the thousands, and feature tanks, rocket launchers and an endless supply of weaponry. Director Fuglsig utilizes a “Days in Country” counter so that we can get some semblance of time and ongoing misery being fought through by the Americans. But no day is normal when the soldiers are on horseback while being attacked by tanks. The odds seem unsurmountable. 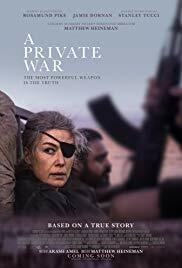 One of the more fascinating aspects of the story and welcome approaches of the film is back-and-forth between Captain Nelson and General Dostum. Initially, Dostum shows little respect by telling the young officer that he lacks “the eyes of a killer” and isn’t yet a warrior, and he spends a great deal of time lecturing and philosophizing on Nelson’s behalf. Of course, the lessons may be frustrating in the moment, but aren’t lost on Nelson as there is a huge payoff at the peak of the key battle. The battle scenes come in all sizes – small skirmishes and massive, large scale assaults. Each is intense and dramatic and well-staged, though there are some moments where we shake our head in disbelief. At least we do until we remember that this is a true story, and despite that, it is truly unbelievable. The supporting cast includes Michael Pena and his snappy punchlines, Trevante Rhodes (MOONLIGHT), William Fichtner with a shaved head, Elsa Pataky – Hemsworth’s real life wife as his screen wife, Taylor Sheridan, Geoff Stults and Jack Kesy. Rob Riggle plays Colonel Max Bowers, who was Riggle’s commanding officer when he served in the Marines. The previously mentioned Michael Shannon is a bit underutilized, but the film’s best moments are those with Hemsworth and Navid Negahban (as General Dostum). You likely recognize Negahban as Abu Nazir from “Homeland”. It’s their exchanges that show how the line between allies and enemies is not always crystal clear – even if they are fighting for the same thing. Writers Peter Craig (THE TOWN) and Ted Tally (Oscar winner for THE SILENCE OF THE LAMBS) do a nice job of character development, and the camaraderie of the 12 men of ODA 595 seems authentic – despite some schmaltzy moments over their 23 days of Task Force Dagger. Early on, we are informed that the most important thing to take to war is “a reason why”, and then towards the end, Dostum explains that the United States is in a no-win situation: we are cowards if we go, and enemies if we stay. 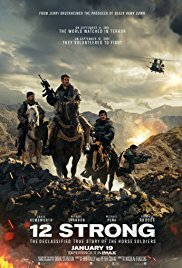 It’s chilling commentary on a war that has dragged on much too long … despite the heroic efforts of the 12 horse soldiers. Greetings again from the darkness. There is something hypnotic about the hand-drawn animation of writer/director Sunao Katabuchi’s film based on the 2007-09 Japanese manga (comic) by Fumiyo Kouno. With some similarities to Takahata’s 1988 classic Grave of the Fireflies, it’s more than a wartime drama – it’s a story of the human spirit. 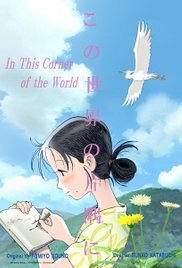 It’s 1935 and Suzu is a young girl who lives in Eba, a town in Hiroshima. She is an exceptional artist with a vibrant imagination and an adventurous approach to life. Her innocence and pleasant childhood existence is rocked when, as a teenager, she receives an out-of-the-blue marriage proposal from a stranger. Life with his family in Kure forces Suzu into a daily routine of cleaning, mending and cooking – all while longing for her family in Eba. 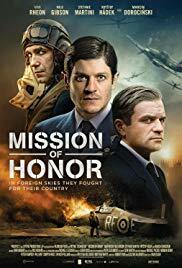 The film clicks through the months and years, and provides a history of war time from the perspective of a family and village. While the date of August 6, 1945 hovers on the viewer’s mind, we experience how family dynamics are affected by war time. For Suzu, her daily routines such as food preparation provide a necessary structure and distraction, despite the ever-worsening shortage of food and supplies. These stresses are compounded by air raid warnings over the radio and Suzu suffers through vivid nightmares. We so easily connect with Suzu as she continually fights through hardships – both physical and emotional – because of her determination to live a good life and overcome all obstacles. 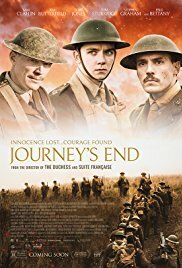 This is such expert story telling with a beautiful presentation, that the film periodically reminds us that war is close by. Even in a war torn country, the people must find a way to go about daily life while treasuring the rare moments of joy and understanding the strength of togetherness. It’s rare that an animated movie can deliver such a humanist look at fully formed characters and their feelings … all within a historical setting.